Be that as it may – the barrier appears to be softening and became evident to me for the first time back in January last year as I attended the HL7 meeting in Sydney. A full day openEHR workshop was presented by a diverse group of Australian companies plus NEHTA experts; Bob Dolin in attendance, amongst others. Keith Boone tweeted his initial impression of the openEHR approach after I demonstrated our tooling and then blogged about it. My thoughts were captured in my Adventures of a clinician in HL7 post. You may have seen some announcements from New Zealand. Firstly, publication in April of the Health Information Exchange Architecture Building Blocks where they specified “2.3.2 The data definitions of the Content Model shall be formulated as openEHR archetypes” within the “10040.2 HIE Content Model, a framework for the creation of a common set of logical data definitions” document. And secondly: HL7 New Zealand and the openEHR Foundation signed a Statement of Collaboration – also announced April 2012. Now there’s a headline that might have been a surprise to many – HL7 NZ & openEHR clearly intending to work closely together! Keynote: EHR – the Killer App? Only last Thursday Hugh Leslie & I participated in a seminar, “Bringing the Electronic Health Record to Life,” organised by HL7 NZ, Health Informatics New Zealand (HINZ) and the University of Auckland. 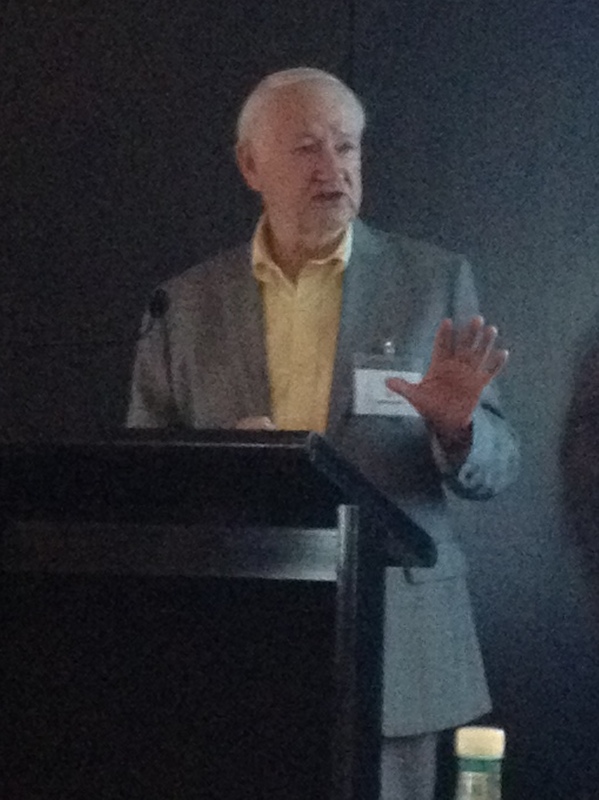 Prof Ed Hammond, ‘the father of HL7’, keynoted the meeting: “EHR – The Killer App”. In the afternoon mini-tutorials, David Hay presented on FHIR, and Hugh, I and Koray Atalag presented a little about our openEHR work, including clinical knowledge governance and clinician engagement. Koray (a HL7 NZ member and openEHR localisation program coordinator) announced within the meeting that HL7 NZ is the likely organisation to auspice a NZ chapter of openEHR. Now that definitely has to start to change the openEHR/HL7 dynamic somewhat, even if HL7 NZ is a relatively small international affiliate 🙂. The HL7 NZ leadership, to their absolute credit, are certainly not being constrained by any traditional ‘turf wars’. The following day, last Friday, Hugh and I presented a full day workshop on openEHR, again sponsored by HL7 NZ, HINZ and the University of Auckland. As I understand it, this was the first opportunity for the openEHR approach to be socialised with the broader healthIT community in NZ; about 25 in attendance including members of the HL7 NZ Board, vendors, and regional and HealthIT Board reps. The focus was on how openEHR could support the creation of a range of technical artefacts to meet NZ’s requirements for CDA messaging (and beyond), generated from a cohesive and governed pool of clinical content models. Interestingly we had a surprise attendee for the workshop – Ed Hammond joined us for the whole day. I won’t presume to guess what Ed has taken away from the day, although he did offer up a comment to the group about the value of exploring use of archetype content directly within CDA. I’ll be reporting on the CIMI project. It would be an interesting day to be a fly on the wall! 2 HL7-ers and 2 openEHR-ers addressing an HL7 meeting – all exploring alternatives to the current approaches! So, keep your eye on the space where HL7 intersects with openEHR – might be some interesting developments. In Australia, NEHTA has piloted the use of clinician-reviewed archetypes from the NEHTA Clinical Knowledge Manager as the start point for generating a number of the PCEHR technical specifications. This work is ongoing and being extended. CIMI, the initiative that grew out of HL7 but is now independent, is seeking to develop an internationally agreed approach to clinical modelling and generation of multiple technical outputs. It has already agreed to utilise openEHR ADL 1.5 as its modelling formalism and is using the openEHR Reference Model as the starting point for developing a CIMI Reference Model. We watch this progress with interest. And Brazil’s national program has recently reconfirmed its intention to commence using openEHR. Whether the final solution is openEHR or CIMI or even something else, I think that the advent of standardised clinical models as the common starting point for generation of a range of technical outputs is upon us. Ignore it at your peril. And specifically, I would suggest that HL7 International should be considering very seriously how to embrace this new approach. Grahame Grieve posted CIMI at the Crossroads recently. I can’t disagree with a lot of the content, but maybe I’m a bit more of an optimist as I draw some slightly different conclusions. a significant agreement of an initial approach to clinical models – a primary formalism of ADL 1.5/AOM with a commitment to support transformation to isosemantic UML models in a spirit of inclusivity and harmonisation. And as he points out, the notion that the modelling methodology was chosen independently of the Reference Model is somewhat disconcerting. “…the decision to choose ADL/AOM as the methodology, while deferring the choice of reference model. While I understood the political reality of this decision, choosing an existing methodology (ADL/AOM) but not the openEHR reference model committed CIMI to building at least a new tooling chain, a new community, and possibly a new reference model. The cost of this is high; so high that the opportunity created by the foundation of CIMI may likely founder if we see another attempt to reinvent the health IT wheel, yet again. There are many opinions, and everyone at the CIMI table has their own bias, history, experience. Organisational and personal investment in each existing solutions are high. No one wants to throw away their efforts and ‘start again’; everyone wants their work to be the successful and sustained. The CIMI community do need to make an objective decision if it is to move forward. It may not be result which wins a popularity contest. It is very likely that some members will walks away and keep working as they always have; maybe intending to return when a more mature solution is on offer. This is the first choice: pick the least worst established clinical modelling paradigm. “Least worst” – Thanks Grahame! You could turn that around: the ‘best’ available so far, where there is no perfect solution! But it’s not a bad principle – to take the least worst and make it better! “If the CIMI group chooses to use ADL as the formalism then the openEHR community is prepared to explore the Foundation governance arrangements with the CIMI group and align the two efforts using the structures that are mutually agreed. Seems sensible to me – start with a robust candidate and modify/enhance it to meet the collective needs. The latest version of the openEHR RM is clearly one candidate. It has evolved significantly from the 2005 version which forms the basis of ISO 13606. Given that ISO 13606 (parts 1-5) is due for revision this year, perhaps we have a great opportunity for harmonisation. The openEHR community is already starting to develop a proposal for the revision, but a greater achievement would be to align all of these efforts into a new 13606/openEHR/CIMI specification. This is a difficult task that we are trying to solve. We know that because it has not been solved before. This is definitely not the first crossroad that CIMI has encountered – don’t underestimate the effort that has brought the group to this point – and it will definitely not be the last. What will determine success is keeping the end goal front and centre in CIMI’s decision-making; cutting ruthlessly through the political and personal agendas; putting pragmatism ahead of perfection; and a willingness to compromise in order to move forward. It may not be possible. It could be a hell of a ride. I still think it has the potential make a hell of a difference. CIMI held its 5th group meeting in San Antonio from January 12 – 14, 2012. Over 35 people attended in person with an additional 5 participants attending via WebEx.